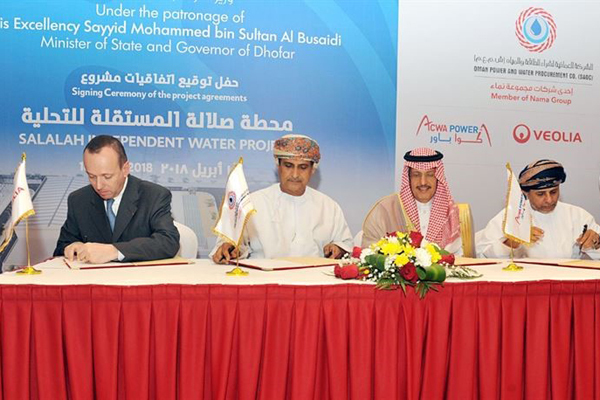 Oman Power and Water Procurement Company (OPWP) has awarded a RO60-million ($155 million) contract to a consortium led by Saudi-based Acwa Power for developing the sultanate's first independent water desalination (IWP) procurement in the governorate of Dhofar. The consortium, Dhofar Desalination Company, includes French water and energy management company Veolia and Dhofar International Development & Investment Holding Company (Didic) as partners. The Salalah IWP project will be vital in meeting Dhofar region’s increasing demand for water, which is expected to be at an average of six per cent per annum over the next seven years, said the statement from OPWP, the sole procurer of all electricity and water capacity in the sultanate. The plant, which will have a capacity to generate 25 million gallons per day of desalinated water using reverse osmosis technology, is procured by OPWP under a build-own-operate framework on the back of a 20-year water purchase agreement. The signing ceremony was held in the presence of Sayyid Mohammed bin Sultan Al Busaidi, the state minister and governor of Dhofar, and a number of government officials and representatives from the consortium and electricity sector in the sultanate. Speaking at the event, Yaqoob bin Saif Al Kiyumi, the chief executive of OPWP said: "This project is considered as the first standalone water desalination project in the governorate of Dhofar and would positively contribute to security of water supply in light of urbanisation and ambitious projects that are implemented in various sectors." Al Kiyumi pointed out that the RO60-million project reflects the confidence of foreign investors to invest in the sultanate and in the water sector in particular, given the legal and regulatory transparency and stable environment. Paddy Padmanathan, the president and chief executive of Acwa Power, said: "Water is a vital resource for development and human life, and we are pleased to work in partnership with OPWP to deliver desalinated water to the region." "This project is one of a number of projects we are currently working on in the sultanate and we look forward to continue to supply power and water at an economical cost," he noted. Rajit Nanda, the chief investments officer at Acwa Power, said: "“The Salalah IWP project will play a key role in meeting the increasing demand for water in the sultanate. This significant milestone will support Oman’s infrastructure in line with the country’s efforts to reduce reliance on groundwater resources and maximize the use of local resources." "Oman continues to be one of the leading investment destinations in the region, and we look forward to furthering our growing presence in the country," he added. OPWP said as per the deals, the engineering, procurement, and construction of the plant will be handled by a consortium of Fisia Italimpianti and Abeinsa Infraestructuras Medioambiente, while the operations and maintenance of the plant will be undertaken by a consortium led by Veolia Middle East with Nomac Oman and Didic.